Pepsi drew some backlash last week when it’s controversial new advertisement featuring Kendall Jenner made light of the Black Lives Matter movement across the US. 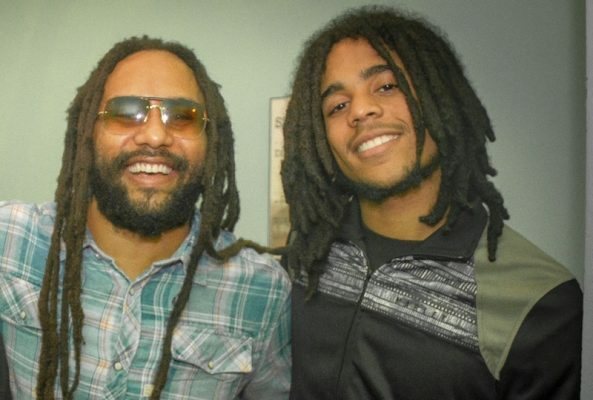 Bob Marley’s grandson Skip Marley is also getting some unwanted attention because his song “Lion” provides the soundtrack for the ad. 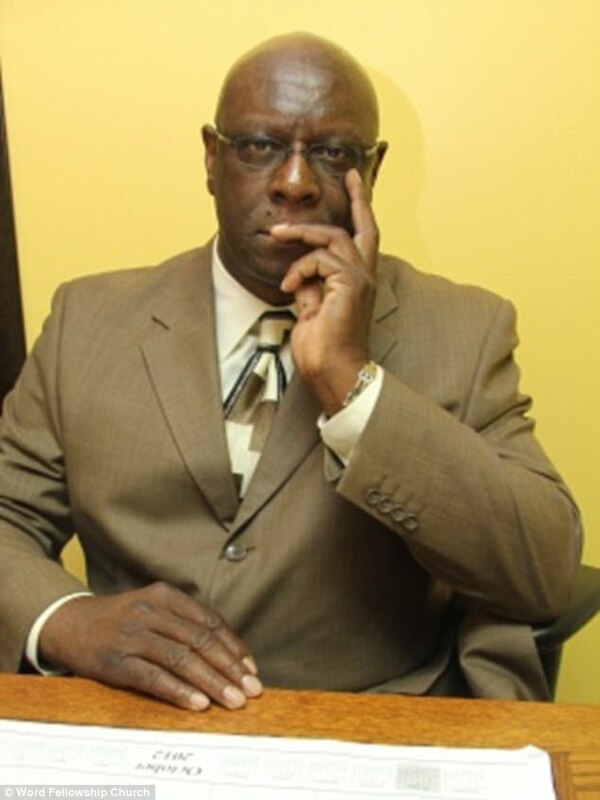 Kendall Jenner also received some heavy criticisms from the folks on Twitter and even some celebrities have weighed in like outspoken radio host Charlamange Tha God. 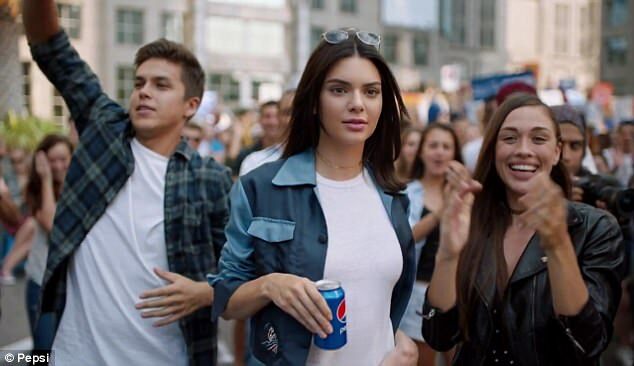 Pepsi has canned its controversial new commercial starring Kendall Jenner, after it was blasted for being 'tone deaf'. The soda giant announced it was scrapping the spot in a statement released on Wednesday afternoon. 'Pepsi was trying to project a global a message of unity, peace and understanding,' the statement read. 'Clearly, we missed the mark, and we apologize. 'We did not intend to make light of any serious issue. We are pulling the content and halting any further rollout. 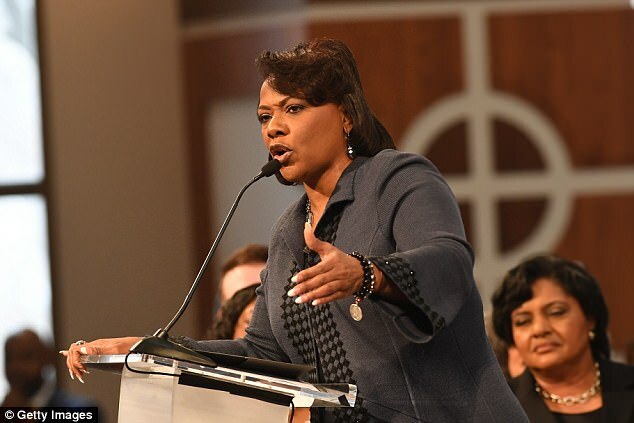 The statement was released shortly after Bernice King - the daughter of MLK - mocked it on social media. Pepsi was trying to project a global a message of unity, peace and understanding. Clearly, we missed the mark, and we apologize. We did not intend to make light of any serious issue. We are pulling the content and halting any further rollout. We also apologize for putting Kendall Jenner in this position. 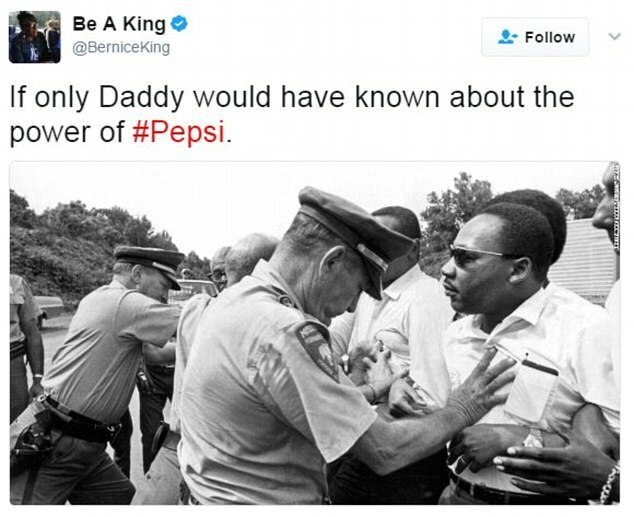 'If only daddy knew about the power of Pepsi,' she tweeted, while sharing a photograph of her iconic father clashing with police on the front-line of a protest. 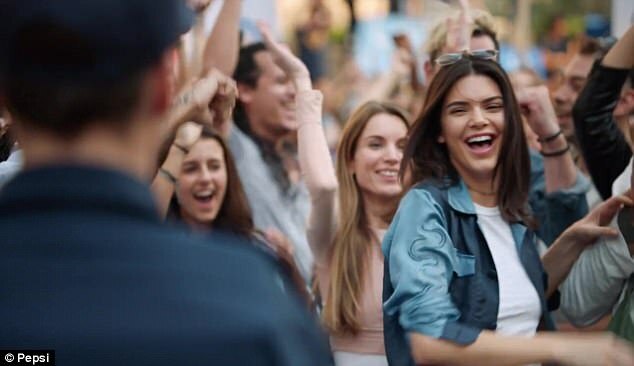 The two-and-a-half-minute commercial features Kendall stepping out of a crowd of multi racial protesters to end a stand-off with police officer by handing him a can of Pepsi. It was also slammed by other stars and celebrities on social media, including: Lena Dunham, Questlove, Judd Apatow, and Patton Oswalt. 'J. Edgar Hoover takes aim from the grassy knoll. The motorcade approaches. He fires. JFK raises a Pepsi to his lips, blocks the bullet,' Oswalt tweeted. 'Assuming everything that can be said about faux-test Pepsi ad has been said so I'm just gonna go with this: it didn't make me want Pepsi,' Dunham wrote. 'That Pepsi commercial was genius troll move of the year, 4 days from April Fools? we talkin/meming bout em too?' Questlove said, before adding: 'Dear corporations let this be a lesson. you run the risk of getting DRAGGED if your boardroom shows NO diversity.---there is NO excuse. And the mocking didn't stop after the ad was canceled, with social media continuing to bubble over with jokes and complaints. 'O'Reilly Factor down to one advertisement for tonight: Kendall's Pepsi commercial,' Josh Brown wrote, in a reference to the current controversy surrounding Fox News host Bill O'Reilly. 'I think it's time to open my "Ask A Black person" consulting firm,' comedian Travon Free tweeted. 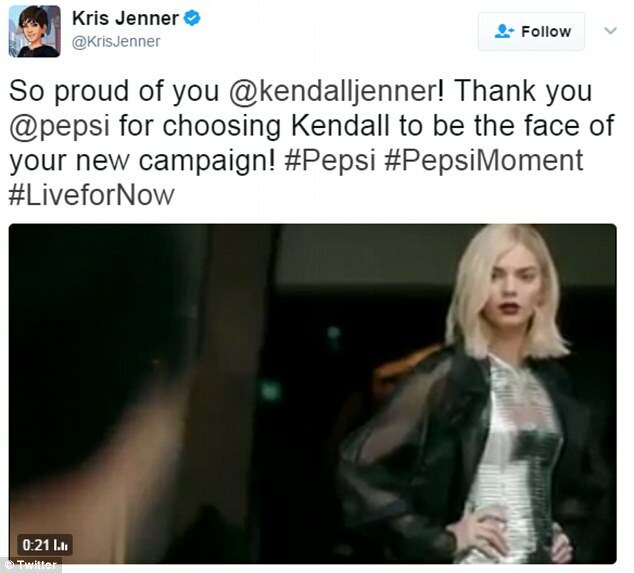 'Pepsi pulling ad + also apologizes to Kendall Jenner - I was under the impression that she's a grown a** woman who was present for filming,' another said. 'Steve Bannon could probably use a @pepsi right about now,' model Ines Helene joked. 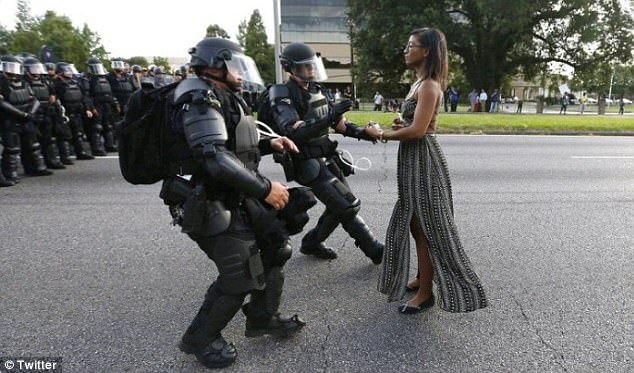 The imagery - whether intentional or not - evokes the real-life moment protester Ieshia Evans faced down lines of heavily armed police wearing riot gear during a Black Lives Matter demonstration over the fatal shooting of a black man by police. 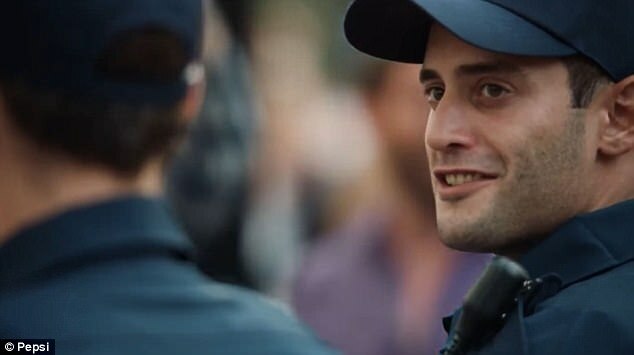 Evans was arrested moments later, unlike Kendall whose actions win her knowing smile from the Pepsi ad's handsome, enlightened cop. The ad has sparked outrage online from hundreds accusing Pepsi of trying to cash in on the Black Lives Matter protests. Twitter was flooded with deeply sarcastic posts mocking the 'tone deaf' ad. Of course, it is not the first time a soda giant has been accused of crass commercialism. Coca Cola faced fierce backlash for their Super Bowl ad, which was actually a re-run, this year which features people of all different ethnicities singing America the Beautiful in multiple languages. People accused the brand of trying to ride the wave of pro-immigrant and unity sentiment shortly after Donald Trump announced his Muslim ban. In another unfortunate creative choice, Coke was forced to pull an online advert in 2015 which appeared to show Caucasian people turning up at an indigenous town in Mexico bearing gifts of soda cans and a Christmas tree for locals. Coke received so many complaints that the ad reinforced stereotypes of whites teaching 'culturally and racially subordinate' indigenous people, that they even issued a rare apology. 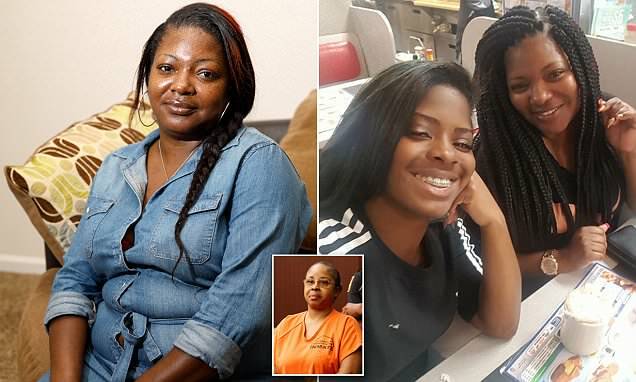 But Pepsi appears to have outdone their rival with an advert which many complains 'mocks' the Black Lives Movement - which began over the deaths of so many young black men at the hands of police and has gone on to spark national and international protests. Violence between police and protesters have been reported at numerous such demonstrations which have even resulted in fatal shootings in some cases. Not then, the most obvious setting in which to set an ad to sell sugary, fizzy drinks. 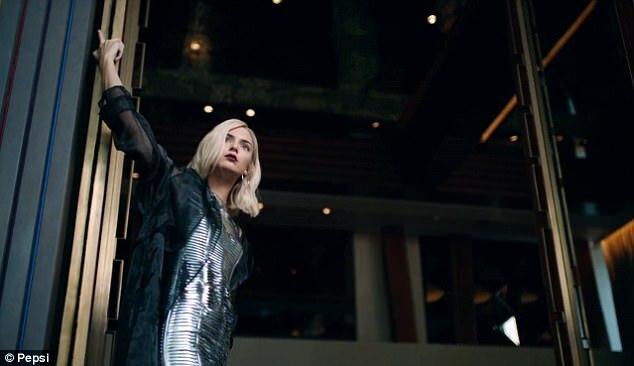 The march continues past a photoshoot where who else but Kendall Jenner is posing, in a short silver dress with platinum blonde hair, in front of the camera until her attention is drawn to a cute protester who gestures for her to join the movement. Suddenly awakened to the cause, and perhaps the frivolity of a life of fame and photoshoots, the 21-year-old rips off her blonde wig, wipes off her makeup and joins the crowd. She is now 'one of them'. 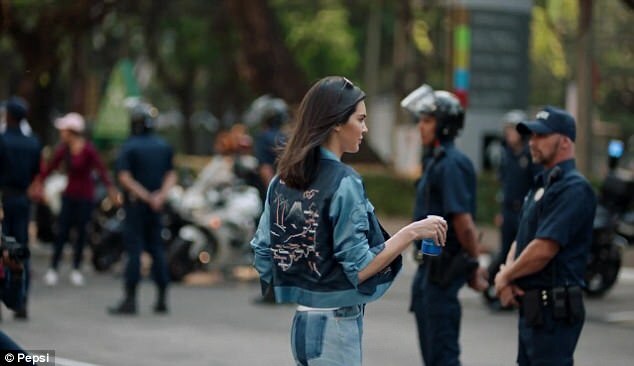 When the crowd come up against a line of attractive cops, Kendall has the solution; Pepsi. Kendall has not yet responded to the criticism of the ad, set to the sound of Lion, a new track by Bob Marley's grandson Skip. But her fans are less than pleased and have taken to social media to call out her and Pepsi. 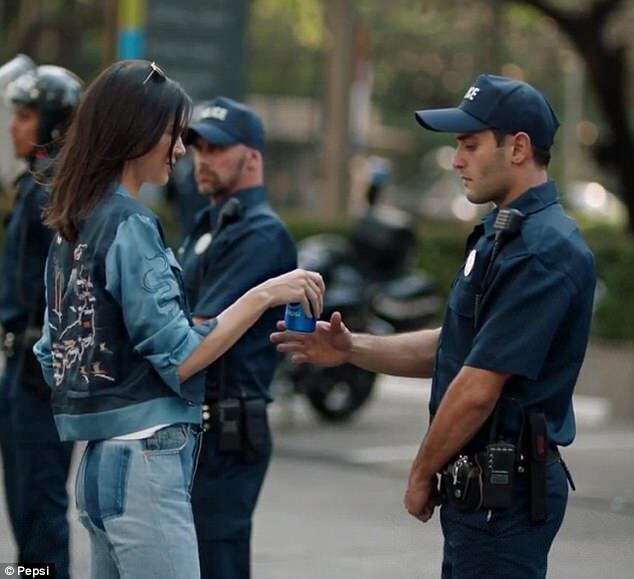 'So according to @KendallJenner and @pepsi the racial tension problem is just a matter of thirsty cops,' another user lamented. Meanwhile members of an Austin Black Lives Matter group were outraged by the ad. 'Wow that is offensive on so many levels,' Haley Bach added. When the voices come as one,it can be extraordinarily powerful to shut nonsense down! @Stroke I think it will take a few generations to get things back on track. The best thing we can do is educate our children. And teach them the right way. There are many things school does not and will not teach and to me that is a key part of the problem added on to poor parenting, lack of role models, and not instilling values in our kids to help them in the future. For example my boys all know how to fish, hunt, farm, and can survive off of the land. I also teach them economics and the value of a dollar but most importantly the value of time. I teach them to be independent and not always leaning on each other to do things they can do themselves. Saddest part that is only a portion of what they need to know especially in these times. Will they be different yes will they stick out yes. Because they won't have the hive mentality they will be free thinkers using logical thinking and not emotionally driven by peer pressure and what others think. This in my opinion is the better solution so that way they can spread their knowledge and be teachers not followers. People like ourselves can form something together. The problem to that is just greed and fame. If this was done I am sure it would gain hate and love but it will also gain power money and revenue. With all of those things it created descension because power tends to corrupt as well as greed. Social media is a perfect example of that. Then if you get someone who does not like what you build they will do all they can to destroy it. I would like to maybe one day we can do a Skype on solutions and talk things out as far as ways to possibly build something. I would say we can try. We have nothing to lose from it and could gain some ground. I am open for it. Let me know your thoughts. Stroke I feel where your coming from but black lives need to matter to us first before anything else. So far black lives matter only championed for criminal elements. Until they march the streets of Chicago, Miami, New Orleans, Houston, Philladelphia, New York, and other spots where we are killing each other I can't take them seriously at all. Malcolm X said it best when he said we can't have black and white unity until we have black on black unity. We need to fix ourselves before we can command and demand change bro. It's like someone having a dog and throwing rocks at it or kicking it. Once others see it they will do the same thing. I saw and was around some of the black lives matter protests and I seen with my own eyes the protesters themselves looting stores, setting stuff on fire, and destroying. If they were sincere they would find their governors, senators, state representatives, mayors, and city officials hones and give them grief. Go to city hall destroy that place. Only then will there be a change. We can fight but we fight the wrong way and the wrong battles and that is why we are losing. Our biggest loss is that homosexuals have used our civil rights laws, we get together with Mexicans to protest illegals being deported which makes no sense because those same illegals are taking away benefits for poversihed American citizens and truth be told they don't even like black people. We as human beings as a whole no longer value right or wrong, logic, common sense, and truth. What only matters now is what makes us feel good. This is the fallout of destruction of families and white liberal agendas. Ok I'm off my soap box but there are better ways to do things and we need to do better.